With PURETi, Cleaning Surfaces and Purifying the Air Has Never Been Easier! PURETi is a sustainable, self-cleaning, odor-eliminating, air-purifying product that is activated by sunlight and very EASY TO USE. It is safe, environmentally friendly, and makes cleaning twice as easy once applied. While all of the benefits provided by PURETi seem too good to be true, the ease of application is really the unbelievable part. Whether you decide to treat your home or car individually or need a professional application by the Grime Stoppers to treat larger surfaces, PURETi is easy to apply and also makes cleaning easier in the future. Using PURETi for personal use in your home or car is simple. PURETi Clean and Fresh is a window cleaner and odor eliminator that improves indoor air quality. It can be applied simply by spraying the interior surface of your windows and then wiping it clean with a microfiber towel. 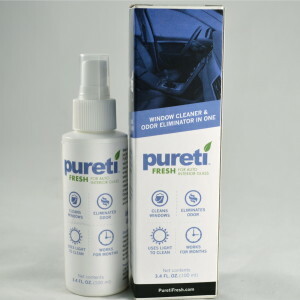 PURETi Clean and Fresh is environmentally friendly and eliminates odors, self-cleans with the power of light, and keeps windows cleaner by minimizing grime. Using PURETi Clean and Fresh in your home or car will keep your windows clean, provide neutral air, and destroy odor molecules. PURETi Clean and Fresh isn’t just easy to apply; it also makes cleaning easier in the future. 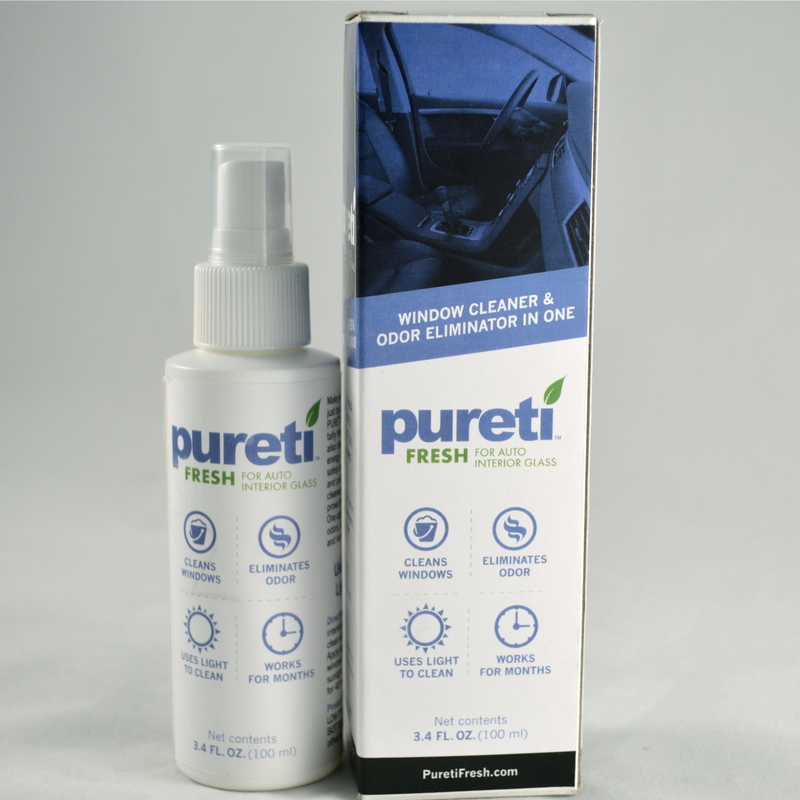 PURETi stops windows from becoming foggy or developing a film of dirt and grime over time. The titanium dioxide in PURETi is photocatalytic (meaning it is energized by the sun) to actually oxidize particulate matter that can build up between washes. PURETi Clean and Fresh is available for personal use in a 16oz spray bottle and in a smaller, convenient 3oz pump spray bottle. PURETi allows you to clean half as often and makes cleaning twice as easy. If you decide to personally apply PURETi Clean and Fresh to your home or car, you should use it every three to six months for the best results. If you decide to have your home or vehicle professionally treated by The Grime Stoppers, application is still quick and easy and the treated surfaces are guaranteed for a minimum of three years. Treating large surfaces like LED screens, roads, university posters, and roofs should be left to the professionals. The Grime Stoppers has certified PURETi application technicians that use special equipment to spray your surface with a thin layer of PURETi. The application takes minutes, the PURETi mist dries in seconds, and it only takes a few hours for the invisible polymeric film to cure and bond to the surface. Professional application is very quick and hassle-free, and the results last much longer. Having your home, business, or property treated with PURETi saves you money and time. It saves you money by reducing energy, water, chemicals, and labor and saves you time by keeping surfaces twice as clean for twice as long and making cleaning twice as easy. Where Can I Get PURETi? The Grime Stoppers is the ONLY local business that offers PURETi products and professional application. If you are interested in individually treating your home or car, check out our DIY PURETi products, or contact us today to have a certified application technician professionally treat your home, business, or property. Copyright © 2019 Grime Stoppers, Inc.